It may be that no passage of Scripture declares annihilationism (the ultimate destruction of wicked unbelievers) with clearer language than Psalm 37. Does it surprise you to find such a teaching in the Old Testament? It shouldn’t. 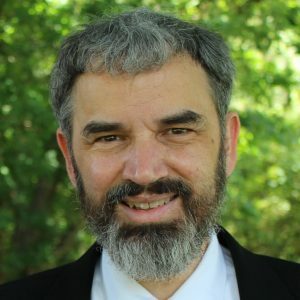 Doesn’t Isaiah 53 contain one of the clearest presentations of substitutionary atonement and Psalm 22 convey one of the most graphic and moving descriptions of the crucifixion? As the Old Testament authors were inspired to share God’s work in their lives and their world, sometimes truths were revealed which went far beyond their own horizons. These words do not sound like eternal torment. They certainly do not sound like universal reconciliation! But they do sound like annihilation. In fact, it’s hard to imagine any language which would more clearly portray the final fate of the unrighteous as one of permanent and complete destruction. How then do traditionalists (those who believe in eternal torment) explain this language in Psalm 37? Sometimes they seem to ignore it. If I was a traditionalist, I would not want to draw attention to Psalm 37! For example, one of the best known recent books defending eternal torment is Hell Under Fire. The book has a chapter devoted to the Old Testament and another chapter devoted to attempting to refute annihilationism. Yet, a peek at the book’s extensive Scripture reference index shows that Psalm 37 is not mentioned a single time. Compare this to a book defending Evangelical Conditionalism, Rethinking Hell: Readings in Evangelical Conditionalism. Not only is Psalm 37 referenced nine times, but the favorite traditionalist proof text from the Old Testament, Daniel 12:2, is referenced ten times, and favorite traditionalist proof texts from the New Testament are engaged vigorously (30 times for Revelation 14:9-11 and 19 times each for Matthew 25:46 and Revelation 20:10). One of the many reasons I became convinced of Conditional Immortality (also called annihilationism) is that we have really strong, excellent responses to traditionalist proof texts, while I have found the traditionalist response to conditionalist proof texts to be very weak and shallow. If you want to see for yourself if it is true that conditionalists have excellent responses to eternal torment proof texts, I encourage you to choose a biblical text and use Google to do a site search on the Rethinking Hell website. I’ve also responded to several of the traditionalists’ favorite texts on my own blog, including Matthew 25:46, and the two passages in Revelation. After some research, I did find a traditionalist response to Psalm 37. In the book, Two Views of Hell, by Edward Fudge and Robert Peterson, Peterson addresses the language of Psalm 37 and similar language found in other psalms and parts of the Old Testament. This sentence sums up Peterson’s response:1Peterson, Robert A.; Fudge, Edward W. Two Views of Hell: A Biblical & Theological Dialogue (p. 91). These verses do not teach that God will exterminate sinners after the Last Judgment, rather they speak of the Lord visiting them with untimely physical death now. In other words, Peterson is claiming that Psalm 37 is not about Hell or final punishment at all. Instead, all of the judgments from God on the unrighteous found in Psalm 37 are about what God does to them here on this earth, in this age. This seems to be the only argument traditionalists have, and Peterson’s explanation of it seems to be the best one available. This is not just my opinion. In the book Four Views on Hell, Second Edition, Denny Burke is the author who defends eternal torment. Burke claims that Peterson has “decisively refuted” (Burke, Four Views on Hell, pg. 86) the argument for annihilationism from Psalm 37. Because the language of Psalm 37 so strongly supports annihilationism, and since Peterson’s argument is the best counterargument available from the traditionalist side, I will interact with Peterson’s argument in some detail. I’m convinced that Peterson’s argument is incorrect, but later in this post I will share a way in which Psalm 37 supports annihilationism even if Peterson is right about it only referring to judgments in this world. First, it is important to note that Old Testament passages sometimes are referring both to God’s work in the lifetime of the human author, and also to God’s work in the future. A good example of this dual reference is Isaiah 7:14, which seems to refer to events in Isaiah’s lifetime, but clearly also is fulfilled in the birth of Christ. There is nothing illogical or unusual about a passage in the Old Testament mixing references to events in the near and distant future. In order for Peterson’s objection to work, it is not enough for him to show that Psalm 37 refers to events in this age. He must go further, to show that the psalm refers to events only in this age (at least with respect to the repeated phrases which suggest annihilation). Verse 39 mentions a “time of distress” for the righteous. That can only be referring to events in the current age. Verse 24 mentions the righteous falling (but not being overwhelmed), which also is referring to our struggles now. The first half of the verse is talking about how God protects the blameless “all their days,” which refers to their present life on this earth. But the second half of the verse goes beyond this to promise them that “their inheritance will last forever.” While it is true that the Hebrew word translated “forever” (olam) does not always mean literally forever, in this context it seems that the translators correctly chose “forever.” I say this for several reasons. First, if olam here merely means “for the rest of your life on earth,” it is normal for an inheritance to last that long regardless of whether a person is wicked or blameless. If it is true that the wicked sometimes are robbed of their earthly inheritance in this life, this is also true for the righteous. Further, we know that the particular inheritance of the righteous that really matters is one that does in fact last forever (Hebrews 9:15, 1 Peter 1:4). As Hebrews 11 makes clear, it is wrong to imagine that the Old Testament saints were not motivated by hope of an eternal inheritance. Finally, as I’ll explain next, beyond the example of verse 18 the entire psalm makes little sense if it refers only to God’s work and judgments in this age. Psalm 37 is written to encourage people who are facing a particular problem. Righteous people are discouraged when they observe wicked people flourishing like a well-rooted tree (vs. 35), and prospering in their ways as they carry out evil plans (vs. 7). As a result, the righteous are tempted to envy the wicked (vs. 1) and experience harmful anger and rage at this injustice (vs. 9). The same issue is described in even more depth in Psalm 73. Jeremiah also complains about the same problem (Jeremiah 12:1), as does Job (Job 21:7-13). Indeed, this is a problem that God’s people throughout history often face. In the midst of this dark world where evil people often prosper and avoid justice, God encourages us through Psalm 37 to “Trust in the LORD and do what is good” (vs 3), “delight in the LORD” (vs. 4), “trust in Him” (vs. 5), “wait expectantly for Him” (vs 7), “Refrain from anger” (vs. 8), and “Turn away from evil and do what is good” (vs. 27). But why should we choose this path when we see the wicked flourish? God gives a number of answers. He does promise help, protection, and provision in this life right now. That is a very important part of God’s encouragement to us. But there is more. God promises that in the long run things will not be like they are now. It will turn out wonderfully good for the righteous, while the wicked will be completely destroyed. Now, here’s the big question. When does this happen? In this life, or at the final judgment? It’s true that even in this life, sometimes there is a turn of events where the wicked reap the consequences of their sin and the righteous are rewarded. In fact, that happened in a limited way during David’s life. But the main problem that the psalm is addressing is that true justice very often does not happen in our lifetime. What about all the Israelites who were born into cruel and unjust slavery in Egypt and died before the Exodus? Many have suffered similar fates throughout human history. Even during Jesus’ lifetime pagan Rome ruled over God’s chosen people. And how many people in recent history and even today suffer under cruel dictators who live long lives with power and wealth while the righteous wither under their oppression and die in their prisons? If this psalm is referring only to God’s judgment of the wicked on earth in the present age, it has very limited application. For the people who need its encouragement the most, who live under the same injustices described by the psalm, its promises would then seem to be empty. This biblical theme of endurance under persecution in this life being repaid by God’s vengeance against the persecutors in the future is repeated many places elsewhere, as when Romans 12:19 quotes Deuteronomy 32:35 to agree that we must not avenge ourselves, but rather leave this entirely up to God. It is no stretch to think that Psalm 37 is ultimately fulfilled in the same manner that Romans says Deuteronomy is. God will have a future day of judgment and vengeance, the Day of the Lord, to settle all outstanding accounts. If it were not for the desire of traditionalists to safeguard the doctrine of eternal torment, perhaps Psalm 37 would be much more widely used as an Old Testament example of God’s ultimate promises: the reward of eternal life for the righteous, and the punishment of destruction for the wicked. In the next two sections, I’ll consider Peterson’s two specific reasons for believing that the destruction of the wicked described in Psalm 37 applies only to this age. Are these statements about annihilation or about God removing the ungodly from the earth? Plainly the later, as the Psalm makes clear. “Do not fret because of evil men . . . for like grass they will soon wither, like green plants they will soon die away” (vv. 1-2, italics added). Peterson thinks that his quote makes his claim clear. I disagree. I’m not sure why Peterson put the words “die away” in italics (he did that, not me). Apparently, he thinks that the phrase “die away” is particularly important to his case. If so, he has undermined his own argument because the phrase “die away” is a very loose, non-literal translation found only in the NIV. Other translations use phrases like “wilt like tender plants” (CSB), “wither like the green herb” (ESV), and “fade like the green herb” (NAS). This language is figurative and uses grass to picture the wicked. It could support the final annihilation of the unrighteous just as well as it could support their annihilation in this life. It’s also possible that this verse is simply pointing out that the wicked, like all people, have short lives. The Bible emphasizes this truth in other places (see Psalm 39:5, Psalm 90:10). If this is the point of verse 2, it fits with an overall eternal perspective by saying in effect, “What happens in this short life is not what counts, it’s eternity that counts.” In which case, we would expect there to be verses elaborating on that general truth by stating eternal truths. And that is what we find: the righteous receive an inheritance that lasts forever, but the wicked will be no more and have no future. Although we recognize that the Bible often speaks in proverbs to assure us that most of the time the wicked will be repaid in this life, we also know from Psalm 73 that the Biblical authors recognize that sometimes the wicked die content and in honor. Only recognizing the truth of God’s final judgment against them can reassure the righteous that there is justice beyond this short life. The language in Psalm 73 agrees with Psalm 37’s annihilation language. Psalm 73 describes rich and wicked men who in the present age “have no pangs until death.” Perplexed by this apparent injustice, the psalmist enters the sanctuary to discern their true end (vs. 17)—when the Lord rouses Himself, “they are destroyed in a moment, swept away utterly by terrors.” So there is reason to think that the congregation of Israel would have naturally read Psalm 37 as indicating an ultimate future, not merely a sometimes-true generality. Finally, even if verse 2 of Psalm 37 were focused on how God treats the wicked in this life, it does not mean the whole psalm is about that. As I already pointed out, the psalm mixes God’s work in this life with His eternal judgments for the purpose of giving us encouragement to keep trusting and obeying God when we see wicked people flourish. This conclusion is confirmed by the contrast between the fate of the lost and the blessing of the righteous in the land: “Evil men will be cut off, but those who hope in the LORD will inherit the land. A little while and the wicked will be no more; though you look for them, they will not be found. But the meek will inherit the land and enjoy great peace” (vv 9-11, italics added). Psalm 37 does not speak of the final fate of the unsaved consisting of exclusion from the new earth; rather it tells of God’s judgments against them on the present earth. Peterson seems to think that because “the land” is mentioned, Psalm 37 can only be referring to what happens in this age. I disagree. Has there ever been a time in this age in any land anywhere on this planet when you could not find wicked people if you look for them? Not even close! 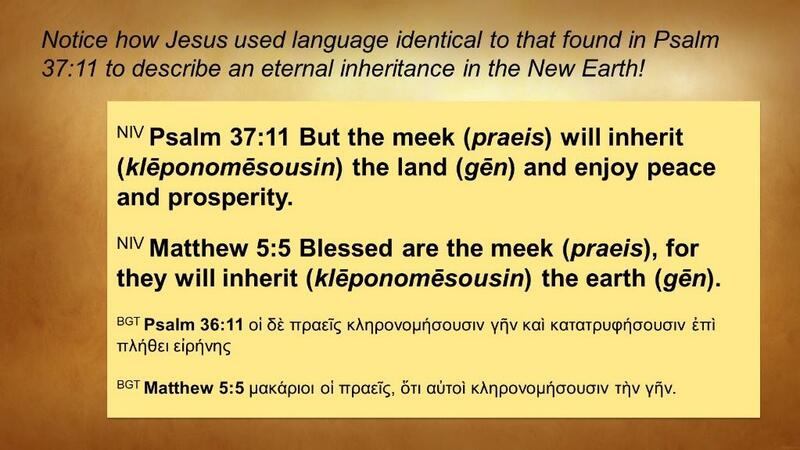 On the other hand, does the Bible ever speak of the meek inheriting the land in a context which refers to eternal life in the new earth? Absolutely, yes! NIV Isaiah 66:22 “As the new heavens and the new earth that I make will endure before me,” declares the LORD, “so will your name and descendants endure. When examined more closely, the use of “the land” in Psalm 37:9-11 actually adds additional support to the annihilationist position, not the eternal torment position. I’m convinced that Peterson’s argument that Psalm 37 does not refer to the final fate of the unrighteous is wrong. But even if someone still thinks that Psalm 37 only refers to what God does to the unrighteous in this life, there is another important way in which it lends support to annihilationism. This last section is a bit more technical, but the evidence it yields is worth the effort. ESV Psalm 37:20 But the wicked will perish; the enemies of the LORD are like the glory of the pastures; they vanish– like smoke they vanish away. The wicked are the same group of people who are the enemies of the LORD. To perish is the same fate as to vanish away like smoke, like grass burned in a fire. They fear that when the soul leaves the body it no longer exists anywhere, and that on the day when the man dies it is destroyed (apollumi) and perishes, and when it leaves the body and departs from it, straightway it flies away and is no longer anywhere, scattering like a breath or smoke. Why is apollumi important? 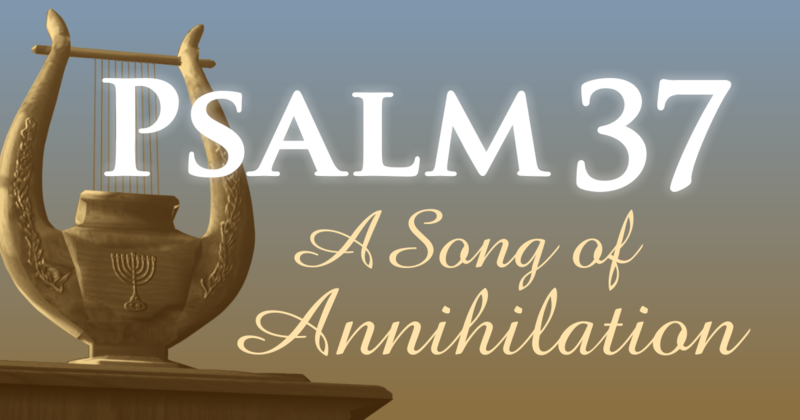 There’s no question that Psalm 37 describes the annihilation of the ungodly. This is so obvious that traditionalists don’t really deny it. Instead, they say that this annihilation is only referring to what happens on this earth and is not the final fate of the unrighteous. 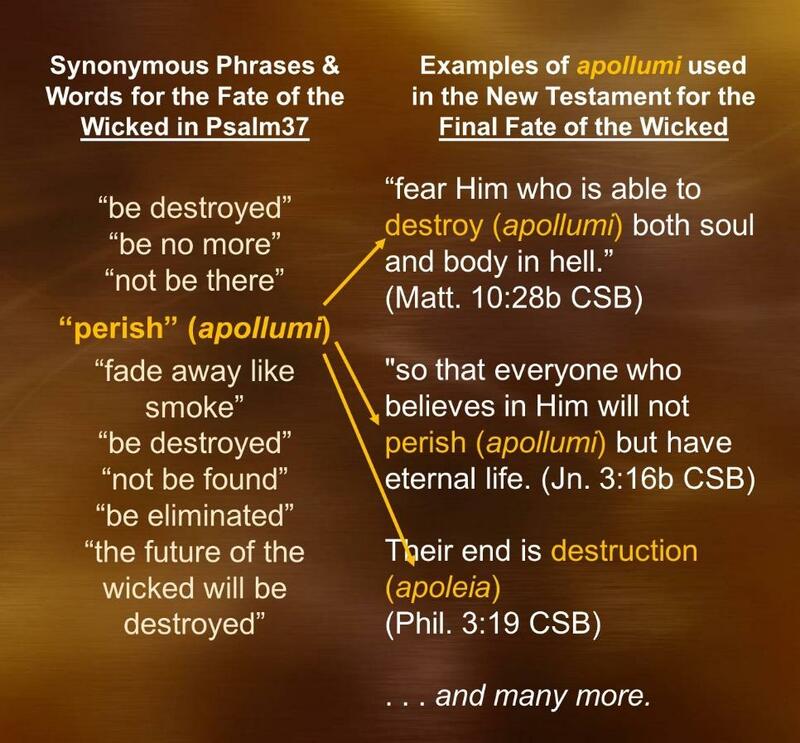 However, apollumi is frequently used in the New Testament to describe the final fate of the unrighteous. The precise meaning of a word depends on its context. Psalm 37 gives evidence that in the context of God’s judgment on the unrighteous apollumi means the complete destruction of a person so that they will “be no more.” This definition supports annihilationism. Whether or not Psalm 37 is referring to the final judgment (I think it is), the New Testament verifies that the same fate of perishing (apollumi) will occur at the final judgment. In the example above, have I used Psalm 37 in some sneaky, complex way to give a new definition to the word “perish” in John 3:16? Not at all! Just the opposite. I’m arguing that “perish” was an excellent translation for apollumi in John 3:16. If the military told you that your brother was captured by ISIS and they had solid intelligence that he was alive but being tortured, you would not say “my brother has perished.” If the military told you that your brother stepped on an IED and was blown to pieces and is dead, then you would say, “my brother has perished.” Psalm 37 helps us to see that apollumi refers to perishing in the plain, ordinary meaning of that word. The language of Psalm 37 strongly supports the doctrine of the annihilation of the unrighteous. Traditionalists, who believe in eternal torment, have attempted to argue that Psalm 37 is only referring to the annihilation of the wicked on this earth. However, the purpose and wording of Psalm 37, do not support limiting its application to this life. In fact, the words of the psalm, the purpose of the psalm, and other Bible passages that address the same theme, all support interpreting Psalm 37 as revealing the final fate of the unrighteous. 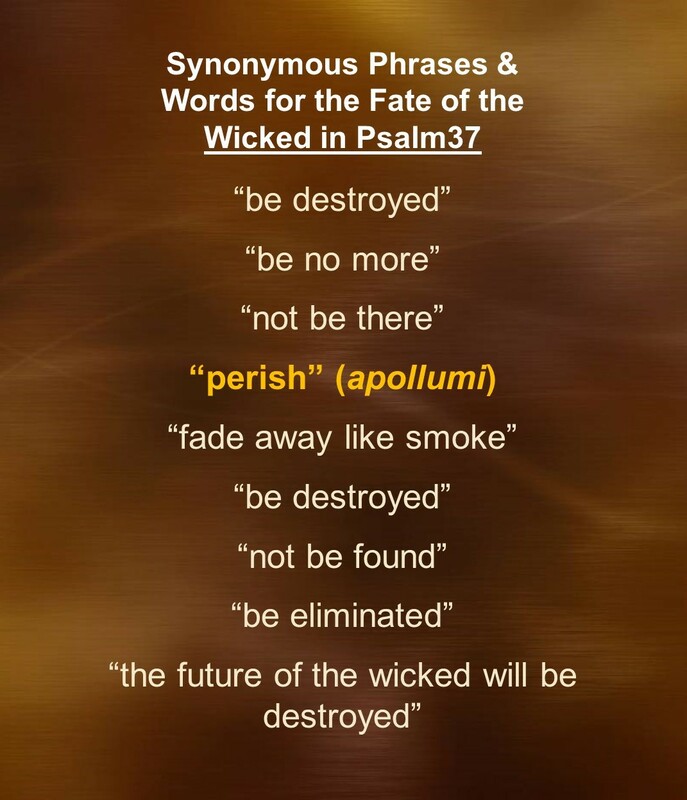 In addition to this, Psalm 37 helps us to see what the Greek word apollumi means when referring specifically to what God does to the wicked in judgment. As a conditionalist, I’m urging my brothers and sisters in Christ to see that the simple, straightforward reading of Psalm 37 (and John 3:16, Matthew 10:28, and many other passages) shows that the unrighteous will perish. In these passages the simple reading is correct. At the final judgment, the unrighteous will be annihilated. 1. ￪ Peterson, Robert A.; Fudge, Edward W. Two Views of Hell: A Biblical & Theological Dialogue (p. 91).